IPConfig (ipconfig.exe) is the well known console application in Microsoft Windows for troubleshooting network problems. It displays all current TCP/IP network configuration values and can modify DHCP (Dynamic Host Configuration Protocol) and DNS (Domain Name System) settings. You can use IPConfig to display the current Internet protocol configuration, identify whether DHCP is being used, and release and renew an automatic IP configuration. NetStat Agent provides a simple to use interface powered by a powerful GUI which delivers easily understood network information fast. Displays the full IP configuration for all network adapters. Without this parameter, ipconfig displays only the IP address, subnet mask, and default gateway values for each adapter. Renews and releases DHCP-assigned IPv4 address for all adapters or for a specific adapter. Flushes and resets the DNS Resolver cache. Displays the contents of the DNS client resolver cache. Initiates manual dynamic registration for the DNS names and IP addresses that are configured at a computer. Displays the DHCP class ID for a specified adapter. To see the DHCP class ID for all adapters, use the asterisk (*) wildcard character in place of Adapter. Sets the DHCP class ID for a specific adapter. Renews and releases DHCP-assigned IPv6 address for all adapters or for a specific adapter. 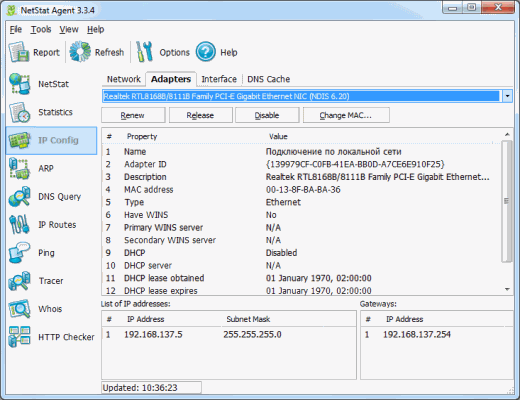 Displays the DHCP class ID for a specified IPv6 adapter. Sets the DHCP class ID for a specific IPv6 adapter. © 2004-2011 Copyright by Flexbyte Software. All rights reserved.